الخيار الأفضل للحصول على المتعة والاسترخاء, Mansfield Motel يقع في منطقة Mansfield في مانسفيلد. يحظى هذا الفندق ذو 4 نجمات بمكان ممتاز يسمح بالوصول إلى المعالم السياحية الأكبر في المدينة، فهو يبعد مسافة 0.2 km عن صخب المدينة. يوفر الفندق بفضل موقعة الجيد وصولاً سهلاً إلى أهم معالم المدينة.
. إن الخدمات التي يقدمها Mansfield Motel تضمن للنزلاء إقامة مريحة. يمكن لضيوف الفندق الاستمتاع بالميزات التالية على أرض الفندق: تخزين الأمتعة, واي فاي في المناطق العامة, صف السيارات, خدمة الغرف, غرفة عائلية . تنعكس أجواء Mansfield Motel في غرف الضيوف.تلفزيون بشاشة مسطحة, اتصال لاسلكي بالإنترنت, غرف لغير المدخنين, مكيف هواء, تدفئة هي بعض الميزات الموجود في العديد من الغرف. يقدم الفندق العديد من الفرص للاستجمام كمثل حمام سباحة خارجي, حديقة. مهما كانت أسبابك لزيارة مانسفيلد، فإن Mansfield Motel هو الخيار الأفضل لإقامة مثيرة وممتعة. Very clean & owners always so friendly, our favourite motel to stay in at Mansfield! Great place to stay at! Friendly hosts and staff, comfortable clean room, affordable price and in a well situated location! Definitely recommended and will definitely come back to Mansfield Motel if I were to return. Thank you Melissa, Ron and your very friendly staff! An hour's drive away from Mount Buller Ski Resort, which was what I came for. Motel has the bare minimum amenities. There's a launderette just across the street which was convenient. Plenty of eateries within walking distance. Staff were extremely friendly and happy to help! Rooms were very neat and clean. Don't have anything bad to say. Would hightly recommend for families or couples or friends travelling to the area or to mt Buller for the snow season. It has every essential and daily needs covered for general travellers like singles, couples or families. the motel was great, not to spacious but still OK for our family (3 adults and 2 kids). value added for this motel, we can park our car in front of our room. a side of this location has many restaurant we can try... recommended! It was a pleasant surprise to feel at home in a motel. Friendly staff and pet dog. Only spent 1 night but would stay there for a week ! Friendly staff, newly renovated. Very clean & comfortable. Value for money. Please note they don't have restaurant in the motel, but they are just around the conner of the town centre. Our brief stay at the motel was satisfactory, but only just. Whilst we were met by a friendly receptionist and found the establishment clean, it was the tiny size of the room and the relatively high cost at $205, that was most disappointing. Yes, the motel was recently refurbished and painted, but it would not brush away the fact that this an establishment out of the 1960/70s with a fresh coat of paint. With nightly fees running at the $140 mark in Mansfield, this is certainly not value for money. Would I stay there again? Well, no. 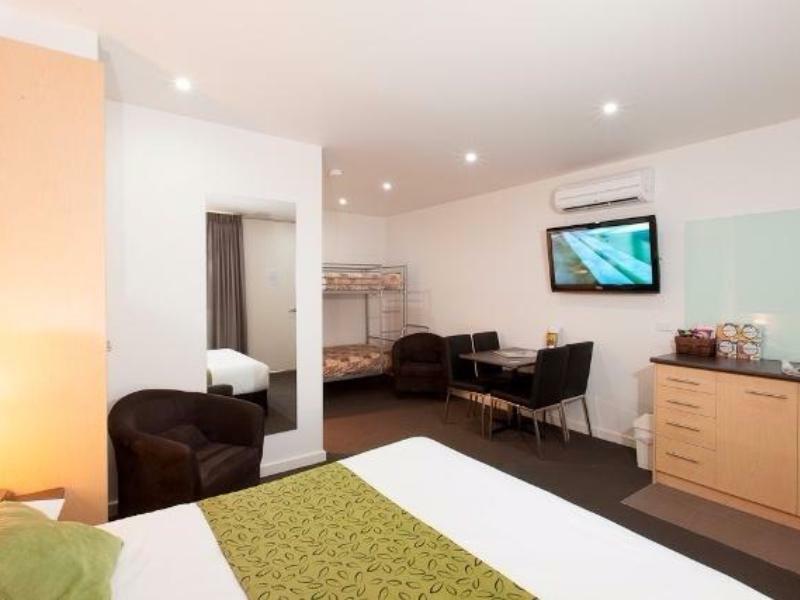 We booked this hotel because we didn't want to spend a ridiculous amount at the accommodation up in Mt Buller over a weekend ski trip. Mansfield is only a 40min drive up to the car park in Mt Buller and we were not fussed about driving up there for 2 days. 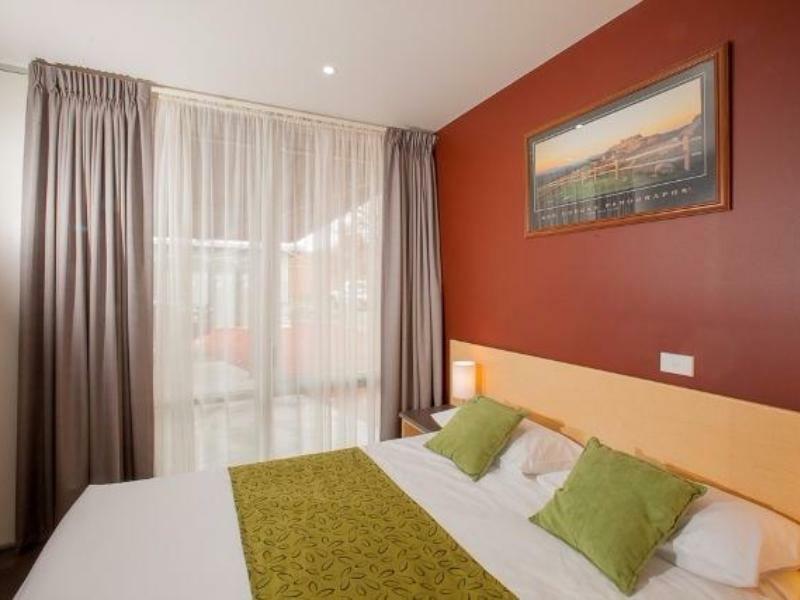 The motel is located very conveniently in the Mansfield town centre, with access to resturants/pubs, banks, post office, supermarket, petrol station, ski hire/rental...etc. Our room at the motel is spacious enough, adequate heating, and was clean, comfortable and quiet where we could get a good night's rest after a long day up in the snows.. Extra blankets and pillow was provided in the closet, and there was a small kitchnette (including a microwave) that we could use. Will definitely stay here again in the future during the next ski season. It was very pleasant and comfortable. 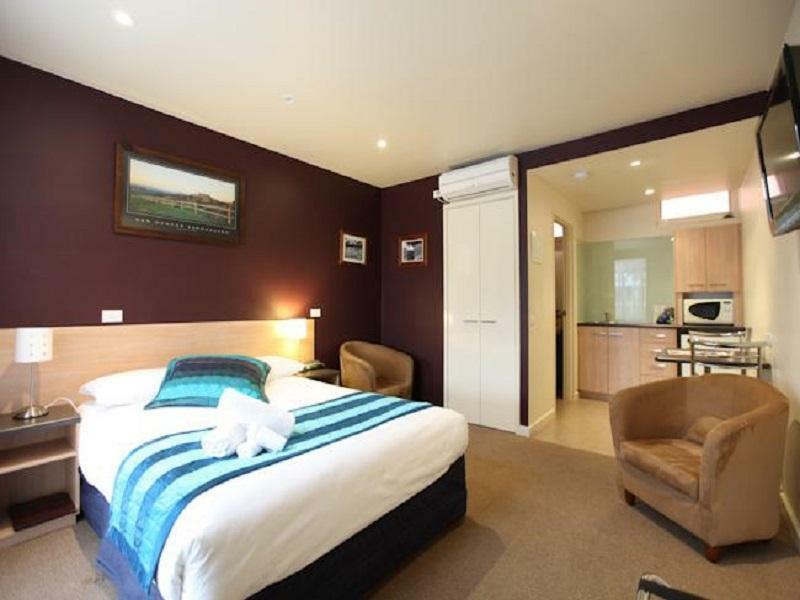 Good and reasonable place to stay before driving up to Mount Buller. 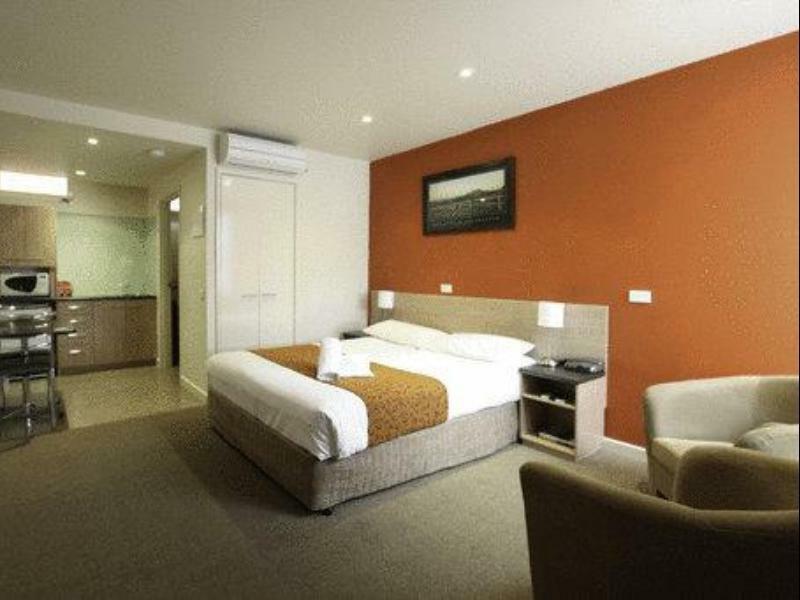 exceptionally clean and quite spacious room air-conditioned. good size bathroom also very clean. we only stayed 1 night after a long day snowboarding so it was lovely to be able to park the car right at the door and have a cozy bed and warm shower in a clean room!